I love hiking. However, if I am being truthful, I am not very good at hiking. It hurts my body. I get chafing. Going up hills with a pack on always makes me want to cry. Yet I keep fantasising about new treks to do. I am obsessed. So when I had four days off in a row, I knew instantly that I wanted to do an overnight hike. Being based in Sydney there are a number of hikes I could choose from. 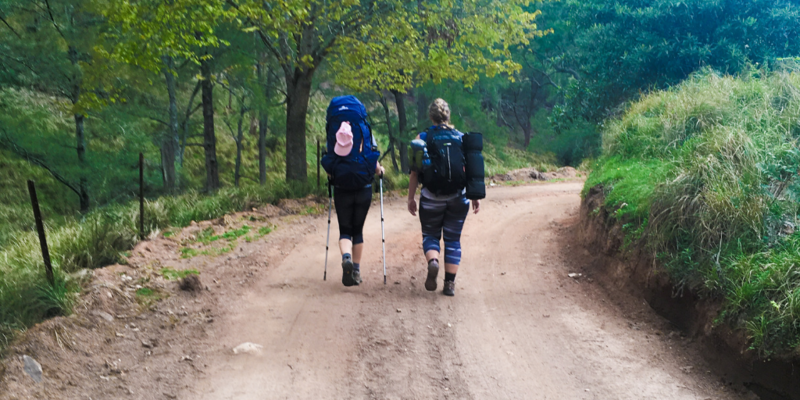 The most famous one for beginning hikers is the Six Foot Track. Not going to lie, I was a little nervous about my ability to complete the track after my experiences hiking a volcano in Guatemala. What was worse, I would be stuck in the middle of the bush if I couldn’t keep going. I needn’t have worried though, I found the hike very doable. So as a very average and not experienced hiker, I can honestly say that the Six Foot Track hike is doable. Not easy, but doable. And lots of fun. 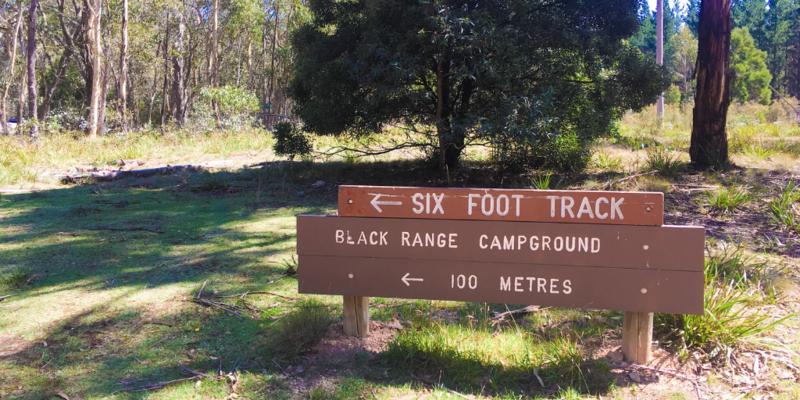 The Six Foot Track runs from Katoomba to Jenolan Caves. It was originally created to supply the Megalong Valley with supplies. The Six Foot Track fell out of use when the roads were properly developed. 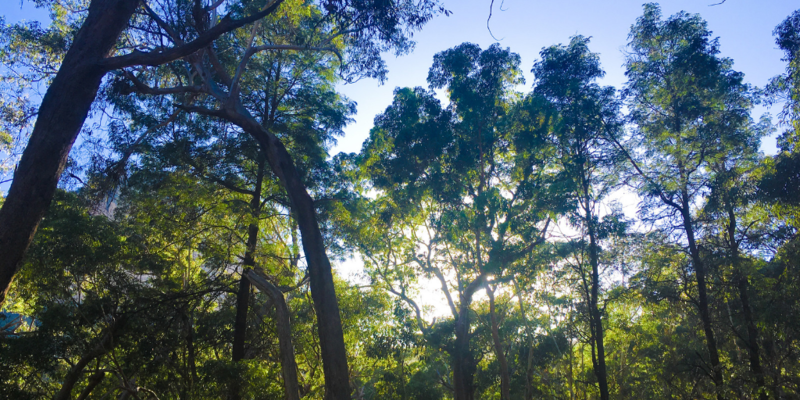 The trail was rediscovered many years later by hikers and has since become one of Australia’s most popular multi-day hikes. 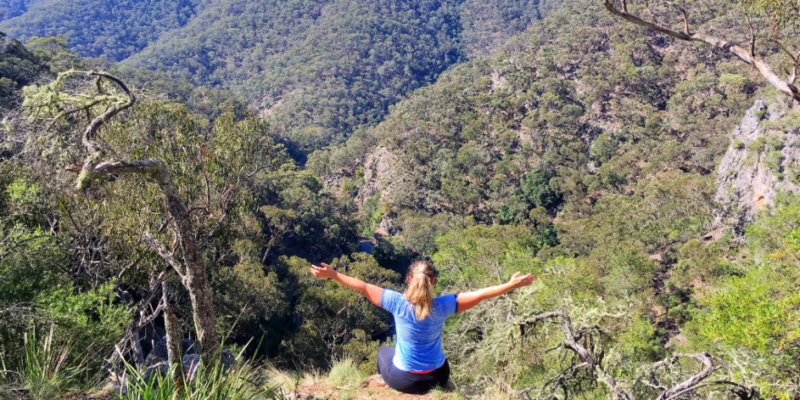 The hike starts in the heart of the Blue Mountains, spiralling down the cliff faces and through the bush. 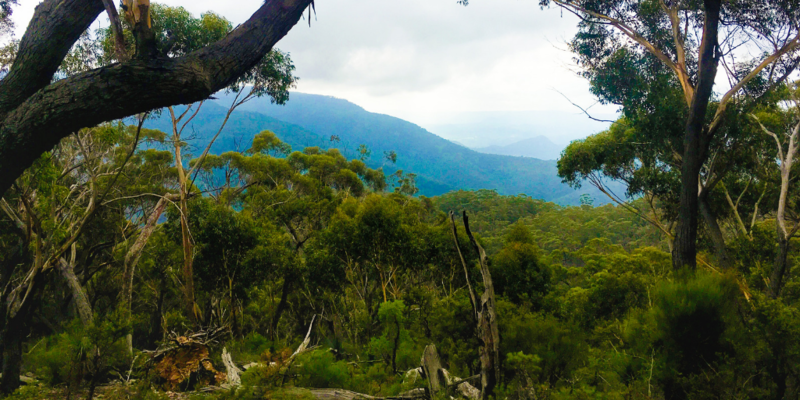 It then winds through the Megalong Valley farmland before disappearing back into the bush that surrounds Jenolan Caves. The track itself is well cared for and easy to navigate. However, there are a number of hills, especially on the second day (which should basically just be called hill day), which make it quite tough. The campsites range from the luxurious (with a drop toilet) to the basic (no toilet). Choosing which one will depend on your comfort level and the amount of walking you want to do each day. I always like WildWalks for track notes. I did go to the official NSW parks website and purchase the official Six Foot Track Map that they recommend. It was crap. Don’t bother. The map on WildWalks is much better. A proper topographical map is best. But the track isn’t that hard to find so I think the one from WildWalks is fine. The best part about this track is how easy it is to get to and from. You don’t need a car or need to hitch a ride at all. We caught the train from Sydney to Katoomba the night before we were due to start the hike. We stayed in one of the backpacker hostels, as it was cheap and was used to hikers. First thing in the morning we set off… only to realise we needed some sunscreen from the supermarket. We then loitered around for an hour until the supermarket opened. Then we were off! It is a 2k walk from Katoomba to the start of the track along the highway. It is an easy walk. However, we were lucky and some friends who were going to join us on the hike gave us a lift. At the other end, you need to pre-book your bus back from Jenolan Caves to Katoomba. It is very easy to do… though a little expensive if you ask me. We arrived 4 hours before our bus was due to depart. However, I noticed that the buses were already there having bought in the morning’s tourists. I had a quick chat with one of the bus drivers and asked him to take us back earlier than the scheduled time. He said he could only go if he had a full bus, as otherwise people would be stranded at the end of the day. Well! That became my mission. For the next half hour, I rounded up fellow hikers we had seen on the trail and who were also loitering around waiting to head back. In no time at all, we had a full bus and were on our back to Katoomba. We then jumped on a train and were back in Sydney before dinner time. My list of items isn’t the most streamlined. If you are a pro hiker, you are probably looking at this and thinking “wear the same socks every day!” But I just can’t do that. I like clean underwear, I like clean socks. So yes it was extra weight, but the pleasure it gave me was worth it. However, if you are one of those people who doesn’t mind being smelly. Then maybe only take 1 or 2 items of each piece of clothing. This was something I was really worried about before I left for the Six Foot Track. I was very concerned that I wouldn’t have enough water. I did, it was perfectly fine and easy to get water. However, I was hiking in autumn when there had been some rain in the weeks beforehand. It may not be so easy in the summer months. At the end of each day, I filled up my water bottles at the water tank in the campsite and added in a water purification tablet. On water purification tablets, my advice is to get a brand that is medically tested. Not all tablets are, and some taste horrible. Pay a little extra for peace of mind and delicious tasting water. We got up early to beat the heat of the day. However, we had to do a little side trip to the supermarket for the very important sunscreen. When we did finally reach the track it was about 9 am. The track starts near the iconic explorer’s tree… which was unfortunately burnt in a bush fire. You can read some great plaques about the tree to learn why it was so important. On the track, the first hour is a very nice hike down a ravine that runs through the middle of two sandstone cliffs. Watching the landscape change from dry bush to the rainforest to farmland as you descend each metre is quite amazing. If you have bad knees though that will be the hardest part for you. I wish I had hiking poles to help take the pressure off my knees. Yep, hiking poles would have made the next two days much more bearable. Once you are down the bottom of the cliffs you are in the heart of the Megalong Valley. 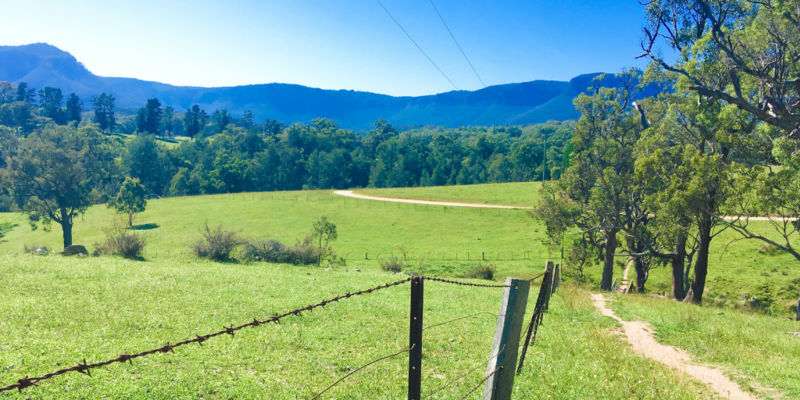 This stunning valley is dotted with picturesque farms that intertwine with the Australian Bush. Kangaroos are munching grass right alongside horses. I loved walking along a track that was one minute in a bright green field and then next in deep bush. It wound against the river for much of the walk, and the sound of water running over rocks added to the serenity. We found a nice little picnic spot along this river. Sitting on spongey grass while eating my tuna wrap was one of the most rewarding moments of the trip. 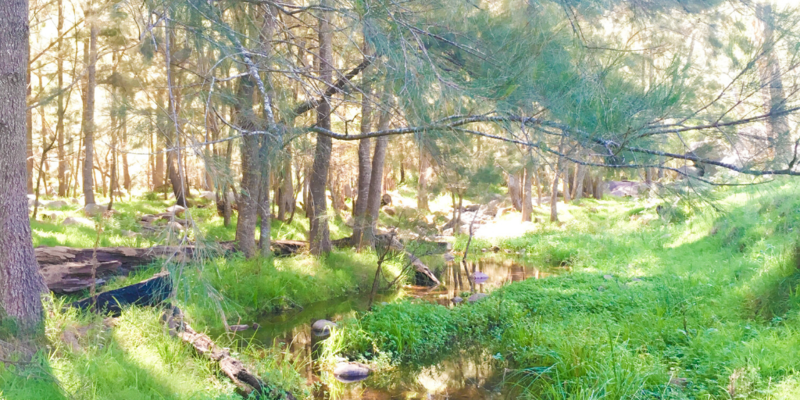 The afternoon was a treck through bushland that ran alongside the river. Just before the campsite, you reach a very impressive wire bridge that will take you to the other bank. I have a great fear of heights but was determined to try it out. Due to how many people were walking the track that day we had to wait nearly an hour to cross. I climbed up the ladder, I stepped out onto the wire, I took about half a dozen steps. I froze. Completely and utterly froze. I couldn’t move a muscle. Luckily my friends behind me were so supportive. They helped me slowly step back towards the platform and down the steps. Back on solid ground, I had a little cry from the adrenalin. Luckily there is another way around if you have a fear of heights like myself. If you follow the river for about another 15 minutes you reach a stone crossing… my boots got a little wet, but it was a lot easier. That night we set up camp by the river and spent the afternoon swimming and relaxing our sore legs. We also trekked back up the track a little to an eco-lodge that serves beer and snacks. 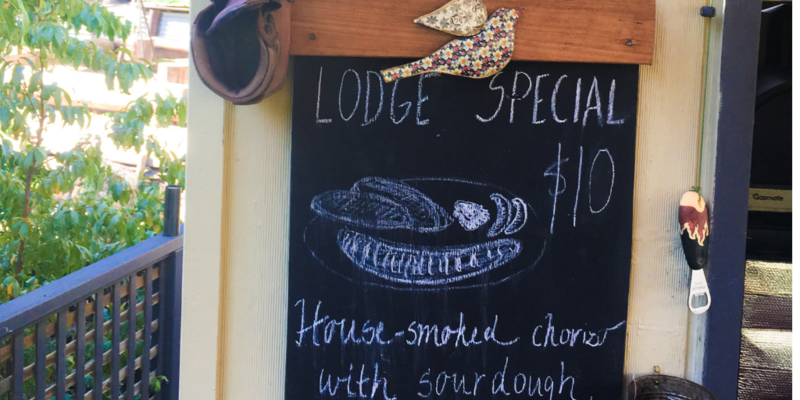 I loved this lodge, and want to trek back to it one day just to stay there. The views were stunning and the beers cold and refreshing. We didn’t eat as we wanted to lighten our packs by eating our own food. But, the menu also looked fantastic. If you are doing the Six Foot Track, maybe consider stopping off for a beverage or two. That night after we returned to camp and made dinner. I fell asleep almost immediately. If I am honest, I think the beer really helped my muscles relax as they were throbbing. Day two, and we were up with the sunshine. We knew that this day would be the biggest challenge. It was going to be all hills. We had perfect sunshine on our first day, so we were all a little nervous of dehydrating in the heat. We got lucky though, most of the morning was overcast. Giving us relief from the sun as we trekked up the giant hills. The track follows an old road for most of the day. Every now and then you need to jump off the road when a 4WD comes past. It was beyond tempting to ask for a lift, I didn’t though. There isn’t much to say about the day, except that there was a lot of climbing up hills. Did I mention the hills? Our lunch was hurridly scoffed at the top of one mountain on the side of the road. I didn’t want my muscles to cool down too much. If I have any regrets from this day, it is that I didn’t stop to look at the views enough. I was so focused on getting up and over the next peak that sometimes I forgot to admire the beautiful valleys below me. The afternoon walk was on a relatively flat track, which was a great way to cool down your muscles. It was through a brush bush forest. With every corner looking exactly like the next. It is when I am in bush like that, that I understand how easy it is to get lost in the Australian bush. Suddenly the track opens up onto a new track that runs alongside a pine plantation. The smell, so different from the eucalyptus, was stunning. You follow that pine forest right up to the campsite for that night. Sadly, there was no river to soak our sore legs in that night. We set up camp, stretched and chatted about the different wildlife we had seen that day. As soon as the sun went down, everyone was in their tent and sound asleep. I was woken in the middle of the night by someone snoring from the other side of the campsite. As the campsite was the size of a football oval, that was quite a feat. Once again we were up with the sun. On this day there were no clouds, but there was a rather fierce wind to contend with. As we headed off, our group started to spread out, with everyone walking at the pace that their legs could handle. The first half of the walk was in stunning bushland, with a few slight hills. Nothing compared to day two, but on tired legs, they felt like a big challenge. 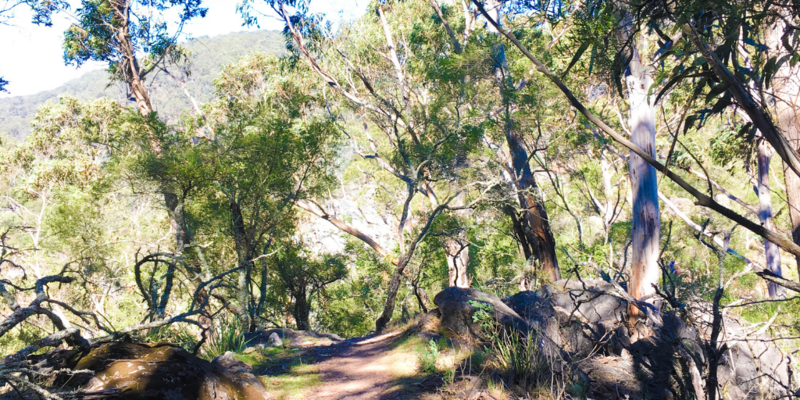 The trek soon encountered the road that snakes through the valley down to Jenolan Caves. For a couple of hours, we followed the side of the road. Which was actually really lovely. The track was set back from the road in the bush, but the track was easy and playful with switchbacks and logs to climb over. My favourite moment was when I passed some wood cabins and discovered a public toilet. Oh, the luxury. The Six Foot Track soon started to descend into the Jenolan Valley proper. Once again I wished I had hiking poles. The track was extremely steep and was covered in gravel. I took lots of very tiny steps as I was petrified that I would slip over the side. Just before the bottom, there are some amazing picture moments with Jenolan Caves house in the background. 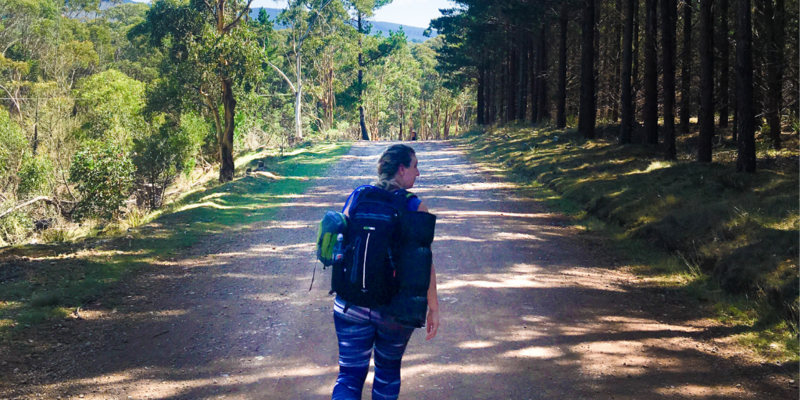 With the wind whipping through my hair, not having showered for three days, and carrying my pack – I felt like a true explorer. Arriving at Jenolan Caves house was definitely worth a celebratory sausage roll and a bar of chocolate. Would I recommend the Six Foot Track? 100%! I loved every moment of the Six Foot Track… except maybe the hills on day two. The track is well cared for so it is easy for the first time overnight hikers like myself. 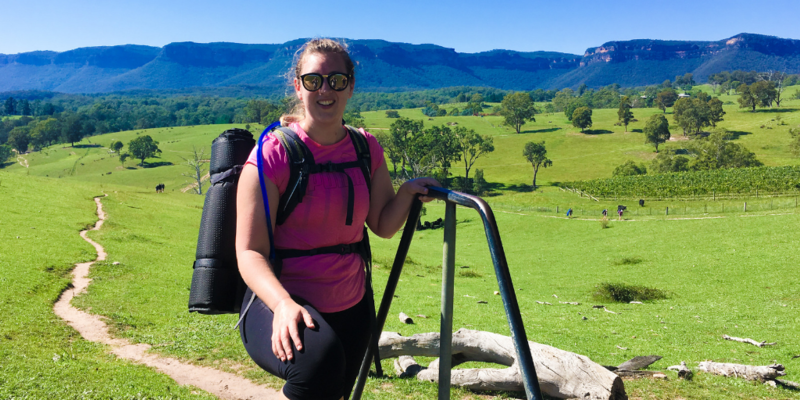 Or for backpackers who are visiting Australia and want to do some hiking. This trail has been made so easy and accessible. I constantly felt as though there was something new and amazing to look at. I was never bored. Seeing kangaroos, wallabies, cockatoos, galahs, sheep and horses made each gruelling hill an adventure. Camping each night under the stars after I had walked so far, gave a deep primal sense of satisfaction. 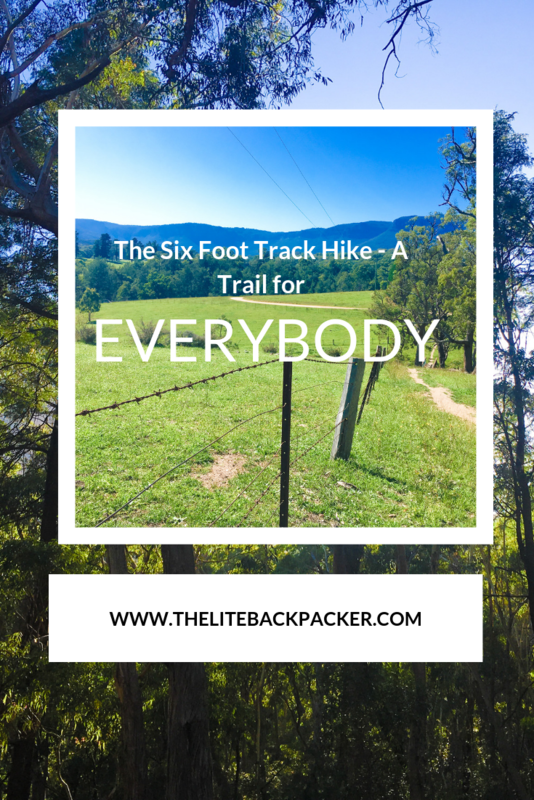 So yes, if you need something to do one long weekend, I definitely recommend hiking the Six Foot Track. A lesson I learnt when hiking Mt Kinabalu in Borneo, was to put your clothes in plastic bags inside your pack in case it rains. This also helped to keep things clean and dust free. Take an extra shirt to change into once you finish the hike. It makes the bus and train ride home more bearable. Take a small flask of rum or whisky to help with muscle relaxation on night two. On night one, stop off at the eco-lodge for a beer.